BACK TO SCHOOL ITEMS ARE IN STOCK NOW AND READY TO SHIP! TONS OF NEW ITEMS! 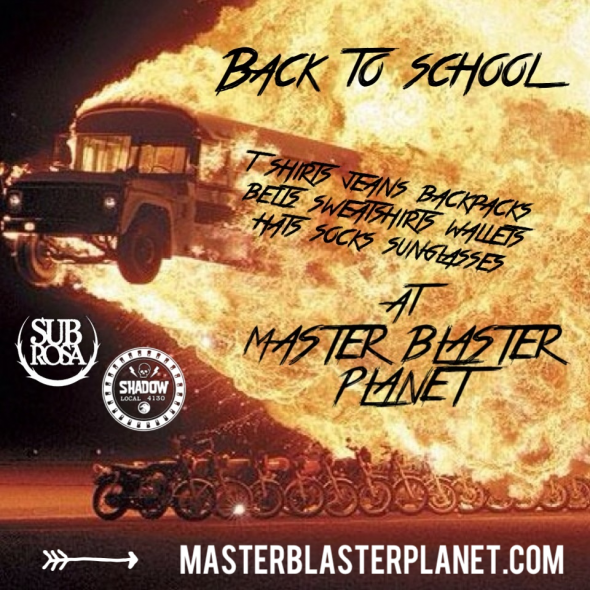 Back to school time is here and we have some of the coolest clothing in BMX! The Shadow Conspiracy, Subrosa, and Bone Deth just released all new t shirts, 3/4 sleeve shirts, sweatshirts, backpacks, jeans, hats, wallets, belts, socks, sunglasses, phone cases, and lots of other super cool items, and they’re all available now! Click HERE to view all of our shirts. Combined sh/h is always available when you purchase more than one item. The sooner you shop the better the chance to get the designs you want, before they sell out! MASTER BLASTER PLANET is your Shadow and Subrosa soft goods headquarters! « PRE BACK TO SCHOOL NEW SHADOW CONSPIRACY T SHIRTS IN STOCK NOW!